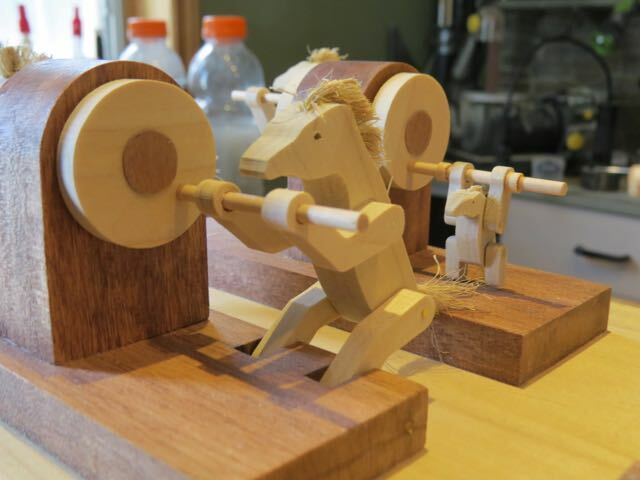 The Story of "7-1/2 Horsepower"
This simple automata was inspired by the popularity of the little desktop toys I take for younger folks to crank when I attend shows. They also happen to be one of the most popular pins from my Pinterest site. Obviously lots of people find them fascinating. This led me to consider assembling a bunch that would work together. To be different I morphed the little men into horses which added to the "cuteness" and allowed for a direct connection to power measurement. Foa a little whimsy, one horse is half the size of the other seven, accounting for the fractional horsepower designation. Its a simple piece both strangely fun and relaxing at the same time. Since I put a sold base on the bottom I decided to extend the project scope into portraying a charger for an automata tablet. The tablet can be seen in the "tonque-in cheek" Automata Tablet video on this page. Having put a flat bottom on the piece that hides the mechanism it provided and additional canvas for the piece. I extended the power generation theme to portray the 7-1/2 horses as a power generator for a wooden tablet. Yes I know, I should stick to woodworking! A collection a few photos of all of the horsepower and a peek at the automata tablet screen from the construction and completion of "7-1/2 Horsepower".